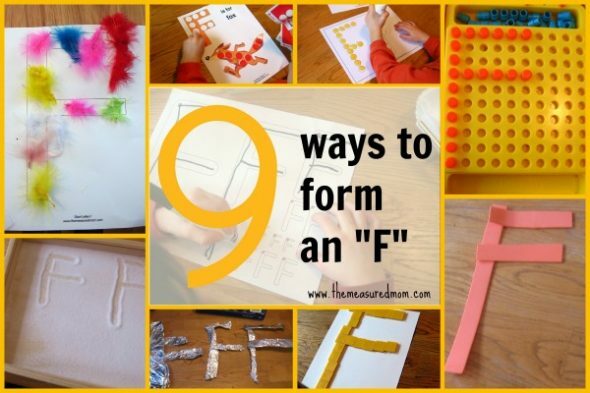 9 ways to make an F – fun fine motor practice! 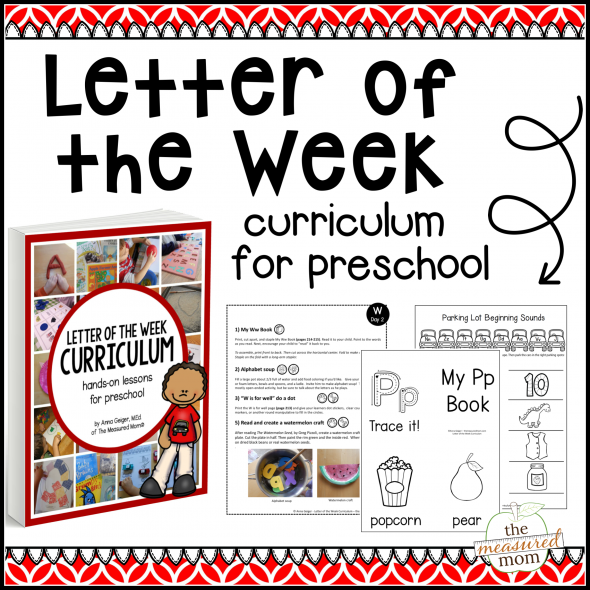 As part of our Letter of the Week, we love to find creative ways to make letters. Read on for nine ways to make an F! 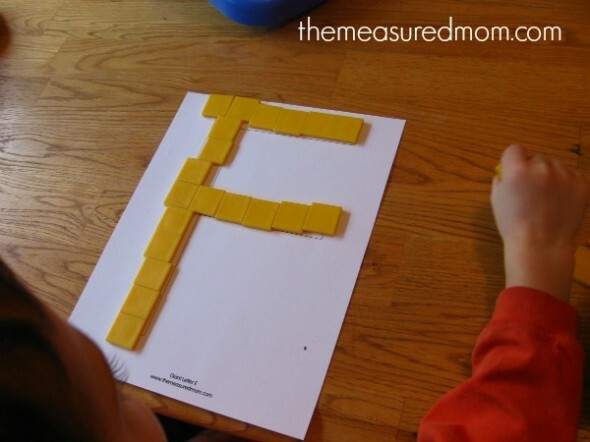 I began by pulling out my color tiles, which work very well for a straight letter like F. Color tiles are a great investment for teaching your little one. 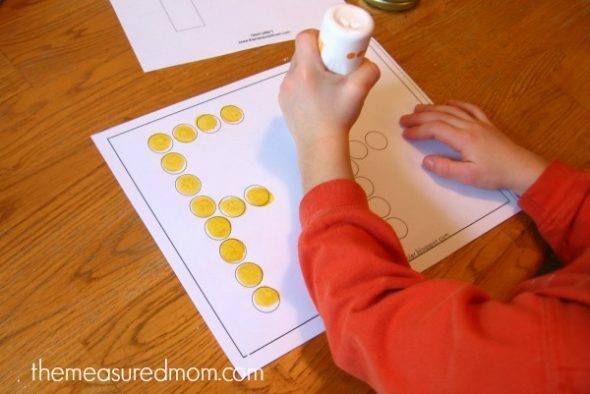 I’ve used them as counters, for building patterns, for measuring, making letters, and more. 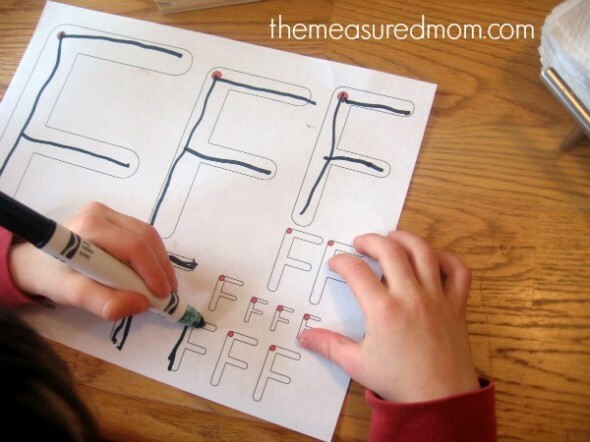 You can make your own giant letter F on your own or use mine: giant letter F.
I created this page so my kids could use dot stickers to fill in the circles. 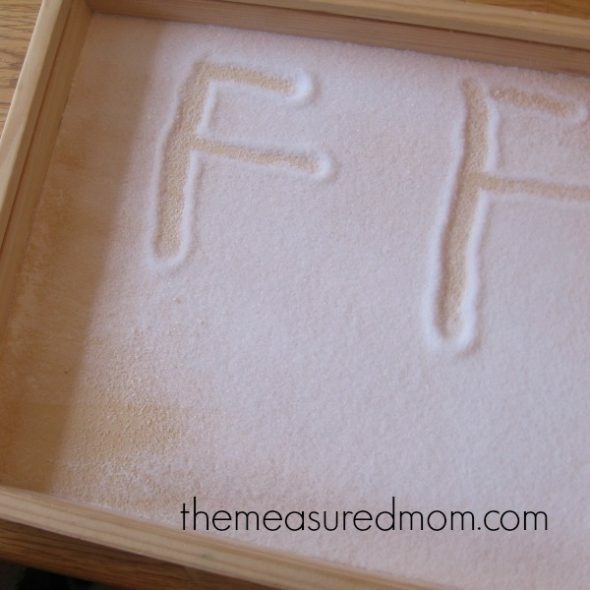 It gives fine motor practice, reinforces the letter F, and is just plain fun. Three in one! This week my preschooler decided to use Do-a-dot markers instead of stickers. Get it here. This was a free printable we got from Confessions of a Homeschooler. 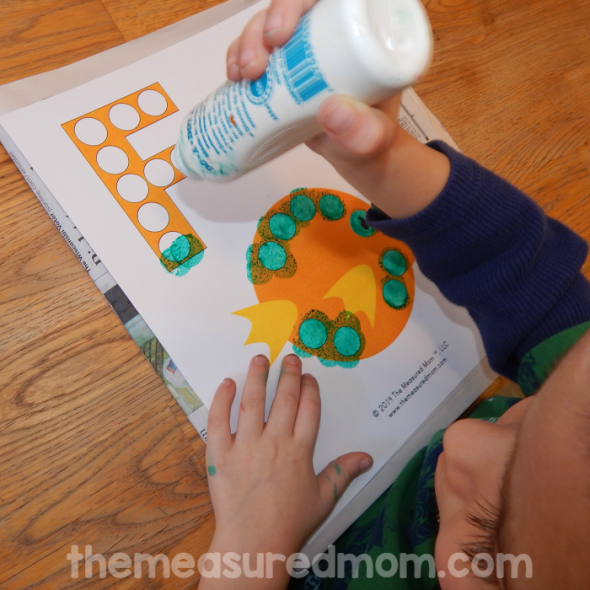 I had seen the Do-a-Dot Art Markers in Michaels and wondered, “Why on earth would you want those?” Then I learned that these are excellent for developing fine-motor skills. They work for making letters, too! Here’s a great activity for when you’re short on time but want to do a quick project. It’s always great when you can form a letter using something that begins with that letter. 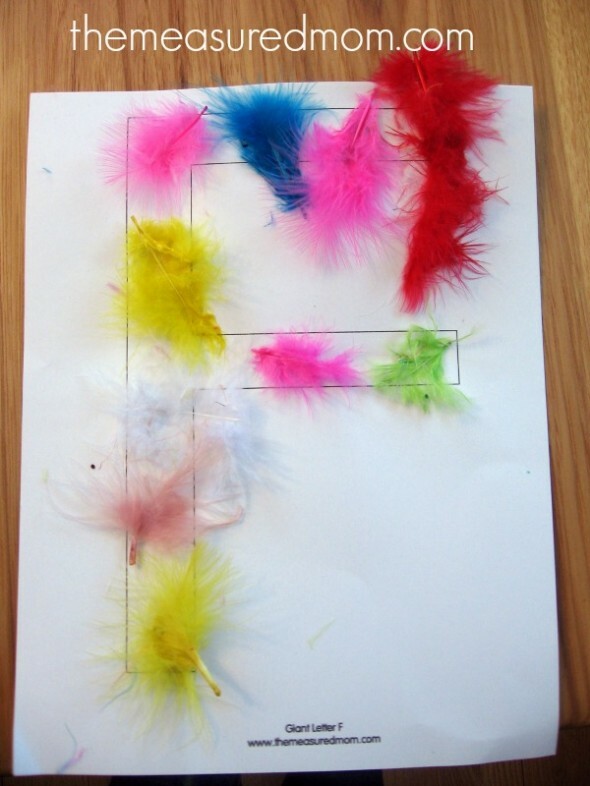 F is for feathers! I don’t think you can get this game anymore (Take 5). My husband saved it from his childhood. 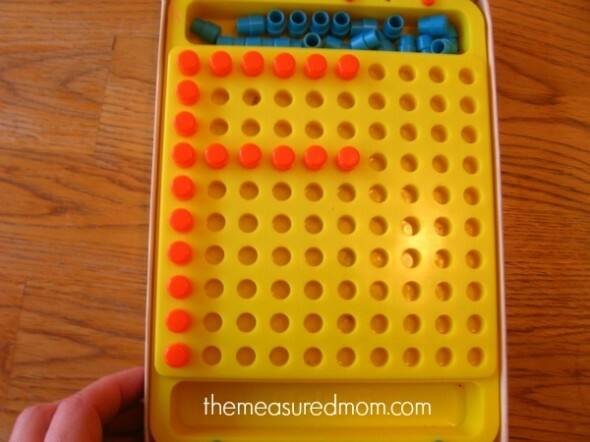 If you have a similar peg board, have your child make letters and shapes on it. 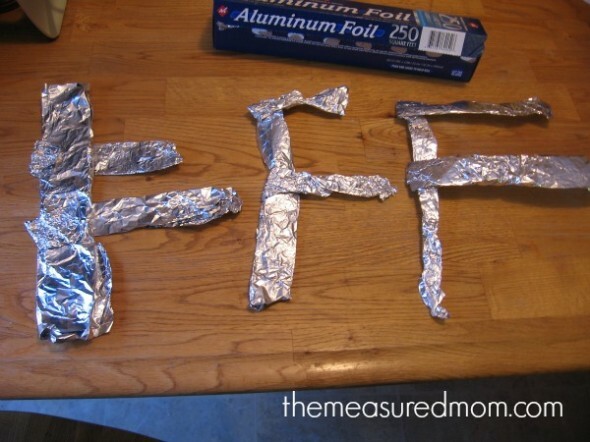 I tore off sheets of foil for the older kids (4 & 5) to make their own letter F. I showed them how you can squish the foil together so that it stays together. This was frustrating for my Four; I won’t insist on that next time. F is for foam. 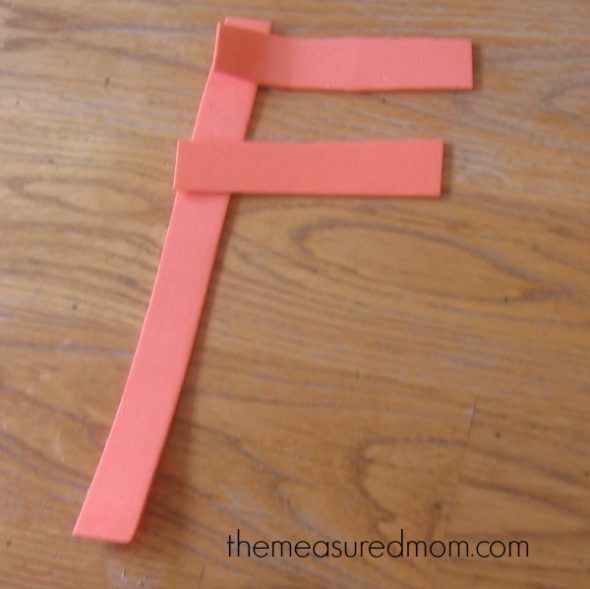 Nothing fancy here – just cut out a few strips of craft foam and give them to your child. I had to explain that the foam does not have to stick together; just lay it out to make an F.
This great wooden tray came with another toy. It’s perfect for writing in. This time we used salt. My Four made a letter, shook it, and wrote again. He really loves this. After forming an F in all the other ways, my Four was ready for this sheet. Since he is not quite ready for traditional handwriting pages, I have him start by writing inside the largest letters and working his way down to the smallest. I was surprised that he welcomed this page without complaining. I think that having the giant letter to start with makes it a manageable task. You can get a copy of this simple handwriting page (as well as a few harder ones) by visiting this page. These are some wonderful ideas. Repetition really helps in letter formation and different textures and sensory inputs allow retention! I would like to invite you to link up at our Share It Saturday linky party. http://www.sugaraunts.com/2013/02/share-it-saturday-8-and-our-week-in.html we have lots of creative bloggers linking up each week and your ideas would fit right in! We also have a Share It Saturday Pinterest board and we are inviting everyone who links up to the party, to join us as collaborators on the group Pinterest board. It is a wonderful way to allow your posts to be seen by new readers. I hope to see you at Share It Saturday! Thanks so much for the invitation, Colleen! I’ll be sure to link up and check out the Pinterest board. Sounds fun!